Keep squirrels from stealing your bird seed with the Brome Squirrel Buster Classic bird feeder. Voted "Best New Product" by the retailers at the Bird Watch America Birding Show in January of 2006, this remarkable feeder is loaded with features that will certainly stop squirrels from raiding it, while still allowing birds to dine. 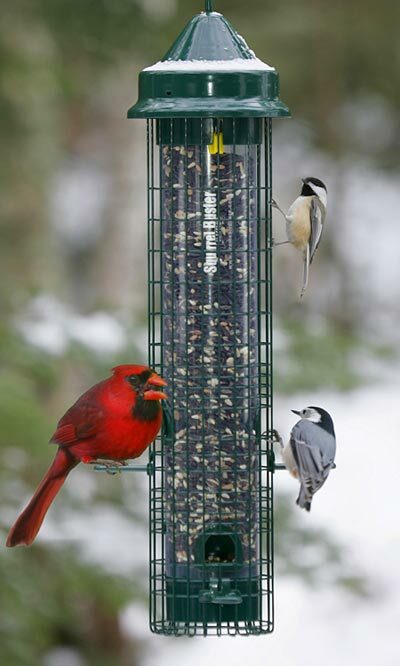 An ingenious, weight sensitive cage surrounds the plastic seed tube, and its spring mechanism is calibrated to four ounces, so nuthatches, chickadees, and finches can feed easily. Four seed ports near the base offer places for your feathered friends to sit and dine, while the wire shroud provides a wealth of perching spots for woodpeckers or nuthatches. When an animal larger than four ounces places its weight on one of the perches, the cage lowers and metal shrouds close access to the seed ports. The reservoir holds up to 1.4 quarts of seed, which is simple to monitor through the clear plastic of the tube. The item's unique, seed ventilation system helps air circulate through the reservoir, for fresh and dry feed, and the lid locks into place to keep squirrels from lifting it. The unit disassembles without requiring any tools, for in depth cleaning, and a metal cable at the top makes hanging the piece simple. Its thoughtful design features create a fantastic, squirrel proof feeder, while the plastic and metal construction is sure to last through years of use. Prevent squirrels from pilfering bird seed using this Squirrel Buster Classic bird feeder. Two year warranty.